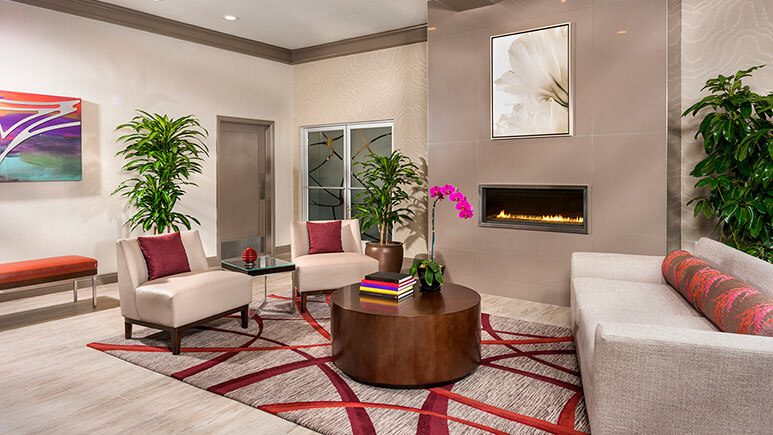 Located less than two (2) miles from the DISNEYLAND® Resort, you'll be able to relax in comfort and style at the ALO Hotel by Ayres. Free hot breakfast buffet every morning will leave you worry free during your vacation. An in-room mini-refrigerator adds to your convenience. 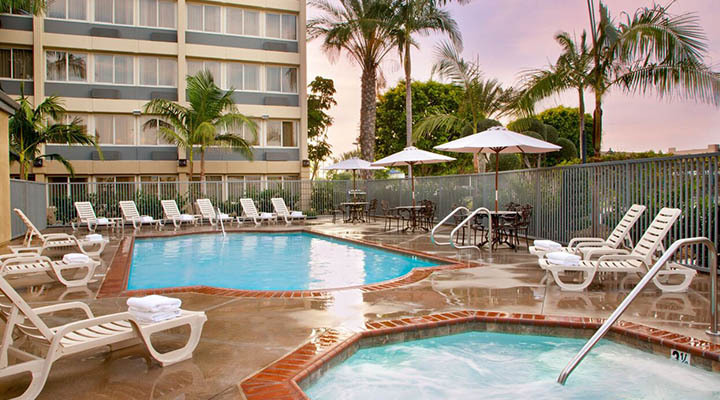 This European style, Anaheim area hotel truly has it all at an incredible price! We stayed here July of 2018 and enjoyed our stay. The breakfast had several cold and hot items. However, you have to be up early to catch it. It ends quite early. The room was great and clean, but the carpet in the hallways was old and made the hallway smell like cigarettes. Other than that everything was very clean. I I thought we would use the free shuttle, but we didnt. We had our car (took a road trip to get there) and ended up driving back and forth as the shuttle runs once an hour. We were too anxious to get to the parks to wait. The first day we tried to take the shuttle and it ended up leaving before the scheduled time. We were there a couple minutes early but it had already left. The hotel did call to resolve the situation but we just ended up driving and enjoyed our time at the parks. Stayed here with our entire family as a big group for my mother-in-law’s 60th! It was a party! Loved the free breakfast and they made everything so special for our group. We ate at the restaurant and it was delicious- very unique (Mexican French Food?? ?- but a top rated restaurant in the area!) We were able to get our rooms close together and the kids loved being there with their cousins. The lobby is nice and the staff is friendly. Family owned hotel and you can tell they take a lot of pride in it. I would also stay at the Ayres Hotel next door. It looked even nicer but was a little pricier. Close to the Anaheim Angels stadium, would love to catch a game next time. 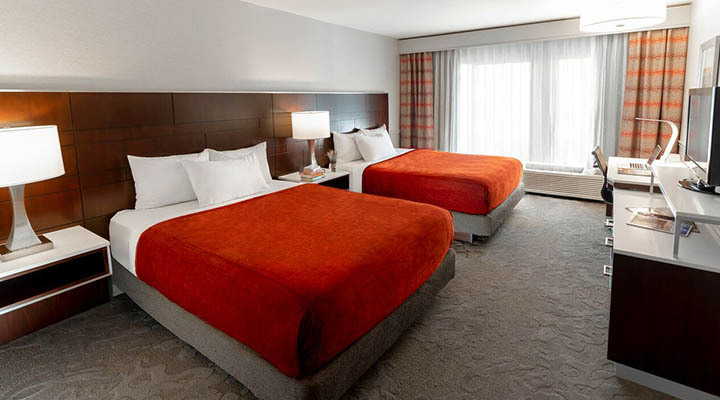 We love our stay at the hotel for these reasons: Great all you can eat breakfast (free), easy checkin and check out, clean room, comfortable beds, convenient to freeways, restaurants, and to parks, free parking, pool, hot tub, cookies in the evening, Fridge in the room. We didn't like these things: Shower didn't drain very well, it would fill up then we would stop during our shower to let it drain before continue, no AC unit in the room but a swam cooler, we didn't know there was an ice machine, micro wave, and workout room until the last day, only one tiny elevator for the whole hotel, shuttle to disneyland only comes every hour, no shuttle to other amusement parks, hallways was stuffed. Our family loved staying here. The room was big enough, always clean when we came back, the staff helped us pick up and pass on a double Bob Stroller with a friend that we borrowed with no issues, the ART shuttle to Disneyland was always prompt. There's really nothing negative to say about it at all. It's a great place to stay. Starbucks is a short walk away, too! Bonus! (Especially since Starbucks in the parks is more expensive and you can't use your freebie drinks there - boo!) This place is also newly renovated and really nice inside. I'd recommend this to people looking for a place with free parking, ART access and a quiet place to sleep (no vacationing kids waking you up before you're ready). This place is great if all you want is a place to sleep! We stayed at this hotel before and expected a bit more than we got. 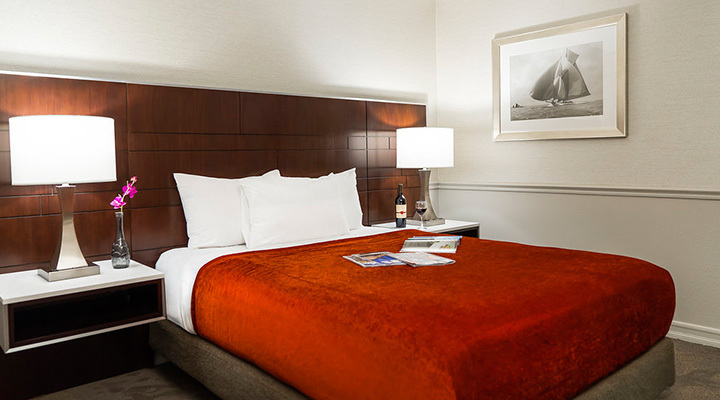 We travel on a pretty tight budget which is why we chose this hotel. We stayed for 5 nights. Room: Basic room, comfy beds. Decent shower/bathroom. They are in the midst of remodeling so aesthetically, it's a little confused at the moment. There are also lots of little storage cubbies that come in handy when you are bringing your own food stuffs to save $$. The lobby looks new and contemporary, but the rooms and restaurant are still in some sort of old English style (Which I liked when we stayed there before). The breakfast was ok. Very basic. It's a step just above a continental breakfast since they have some protein offerings, but it was the same thing every day. (scrambled eggs, sausage links (bacon 1 time), pancakes, potatoes, shredded cheese, salsa, yogurt (strawberry I think), fruit (cut up melon), cereal (very limited but included instant oatmeal), and juice/coffee). There were also bagels, toast and coffee cake. We always try to get in a good breakfast so we don't have to spend so much on food in the park. This did the job but it did get tiring after day 3! Also, they dont start serving before 6:30 which made it impossible to get to our 1 early entry. There is also an excellent hot tub which we value. Hot, clean, good jets). Very unhappy with the ART shuttle service. This is 1 reason we probably won't stay here again. They only stop every hour which made scheduling difficult (wish I'd read that review before). Then, on the last 2-3 pickups our line(14) didn't show up on time. The other line (15) would end up taking us back. On the last night, they didn't show up! We ended up taking a Lyft almost every morning and 2 nights! It never took more than 5 min and was only about $6 (plus tip) so not bad. However, I'd prepaid for the ART so I feel I got cheated there! As for the front desk staff, they didn't do anything wrong but when ever we interacted with them, it seemed like it was an imposition. Maybe I expected and am used to more from a Disney endorsed hotel, but I was not in the least impressed with them. The ladies that managed the breakfast were awesome, they really hustled and were very pleasant and helpful, and the maids did a great job and greeted us every morning with a cheerful "Good Morning! Their tip jar should be in a more visible spot. The desk staff seemed irritated we were there. A last word about the appliances. The refrigerator would not cool very well so we reported it to the staff. They said they put a work order in but never did anything about it. Luckily we didn't really need the thing except to keep my medication cooled which it did. We were there for 5 days. Something should have been done. Also, the guest microwave located on the 2nd floor did not work well. Frustrating when we came home from the park and wanted to heat up some soup. The guest dryer also did not dry our laundry w/o a second round. That wouldn't be all that bad except the desk clerk admonished us saying "you know the laundry room closes at 10, right?" So, all that to say, I probably won't stay there again unless that is the only place in my price range (which was the case this time). We loved it last time but much has changed since then, most importantly the way the staff interacts with the guests. Comfy bed, better-than-average free breakfast, and free parking... It's a great place, BUT after staying here twice for Disneyland trips, we won't choose this hotel again. The ART shuttle to Disneyland leaves the hotel only once an hour, which made it very difficult to plan our days around when it left the hotel and the park (also only once per hour). The earliest shuttle, for example, leaves at 6:50am, but for our Magic Morning we wanted to be at the park by 6:45...which wasn't possible using the shuttle. It would be a nice choice for a one day trip when you will be at the park all day, but it's not convenient for a multiple day trip, especially if you ever want to go back to the hotel during the day for a break. We had some issues with the room cards locking us out but the staff quickly fixed the problem. Seems there was a problem with the locking mechanism. Overall the staff was always friendly! The breakfast was great and the beds were comfy. We took ART direct from the hotel to Disneyland. It was an 8 minutes non-stop trip! Great location! The room we had was a single king and a pull out sofa. Both were very comfy. The bathroom was a little on the small side but otherwise was good. The breakfast was pretty basic - same meal each day: eggs, pancakes, sausage links, hash potatoes and assorted bread and bagels with juice and coffee. The hotel staff was all super friendly and very helpful. We were about 2 miles (10 mins) drive from Disneyland, right by the freeway and other nearby places to eat. I would totally stay here again, great value and I felt very safe in the area. This was a great hotel to stay in! 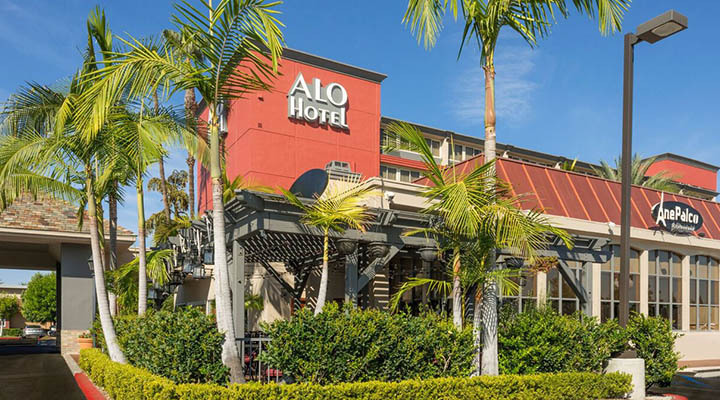 We stayed at ALO for our 3-day Disneyland vacation, and all 3 families loved this hotel. The hotel staff were friendly and very helpful. The rooms were very nice with the most comfy beds/bedding, and the decor was very pleasing. We enjoyed the breakfast provide every morning. 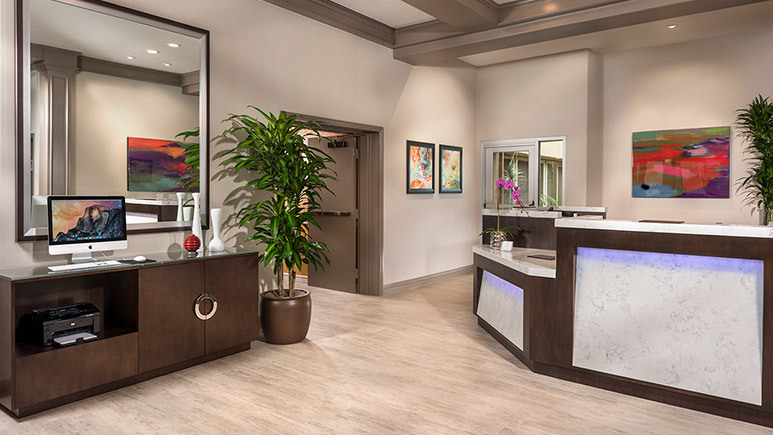 When we return for our next Disneyland vacation, we are definitely booking at ALO by Ayres. Value! Breakfast! VERY Comfortable Beds! Very well kept property! I would not hesitate to book this hotel again! A great price! A great hot breakfast! The most comfortable hotel bed I have ever enjoyed! Older but very well maintained! And EVERY SINGLE STAFF MEMBER smiled and greeted at each encounter! Loved it! Short drive to Disney. Room was nicely furnished and clean. The breakfast was tasty. Our hotel was clean, but the room seemed small and the bathroom was very very small. Breakfast was ok. Front desk people were awesome! Our room was located at the end of the hall by the elevators and the ice machine, and you could hear it all. Our room had an door adjoining door and we could hear our neighbors all the time. Basically noise was our biggest issue. Also, this hotel has the longest bus route to the park. It is supposed to be 40 minutes, but twice we waited over 50 minutes for it to arrive. It was frustrating at the end of the day with tired kiddos. We ended up taking a taxi. This hotel was great, the décor was beautiful, the rooms were comfortable. The front desk was able to accommodate getting those of us traveling together in rooms close together. It was nice to stay somewhere that didn't look institutional. The always fresh complimentary coffee, lemon infused water and in the afternoon warm cookies was a great addition to our stay. The staff was very friendly and always had a smile and a welcome for us when we came back in from the day. If I'm ever in the area again I will stay here. The hotel was very nice and clean. The rooms are small but the beds are very comfortable. Our overall stay was nice. The bathrooms are very small as other's have stated. The free breakfast was okay but not the best. You really can't have picky eaters for breakfast. Our hotel was nice, but we did have a couple of issues. They didn't have any roll away beds even though we had 5 people per room. The "large buffet breakfast" was the reason we chose this hotel, and it was slightly disappointing. We also had 2 rooms that we wanted to be joining, but ended up being down the hall from each other. Unfortunately, our room did not have the best view. The bathroom was also extremely small and could only fit one person at a time!